Jim Armstrong - skip (58) was born in Victoria and now lives in Richmond BC with his wife Carleen, three children, Greg, Jayme and Jody and three dogs. He began curling when he was 8 and has been to six Briers, twice as skip. His Highest moment in curling was reaching the 1987 Brier final (at third) and his lowest was losing that final on the last rock to Ontario's Russ Howard. Severe injuries to his knees and spine ended his regular playing career and in 2007 he was invited to work with the Team Canada squad, sharing his experience. He began playing from a wheelchair and skipped BC to a National title in 2008. He was subsequently cleared to play in international competition by the World Curling Federation's eligibility assessor. 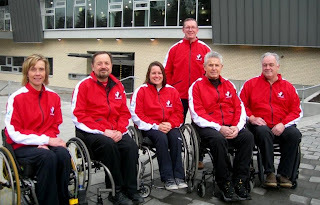 "Wheelchair curling is a great game, a real roller derby of curling. Playing again has meant so much to me. I play and practice during the week with Darryl, and I am getting to know the others on my team. I wish I knew more about the teams we will be playing, and of course on any given day any team can win. But with the experience we have gained this year, and a year of seasoning for those on the team last year, we plan to at least be playing on the weekend." Darryl Neighbour - 3rd (60) was born in Beaver Lodge, Alberta and has lived in Vancouver since 1980. He became a paraplegic after a construction accident in August 2000 and took up wheelchair tennis but was enticed into curling in 2003 by the late Jim Shannon. He curls most days, and in the summer works and volunteers for various organisations involved in wheelchair sports. "I've played in four National Championships, placing higher every year from 4th in 2004 to a national title in 2007. Last year at the Worlds I missed a hit that would have put us into the 1/2 game, but this year the team will do better. The team goal is a podium finish but I am hoping for a gold medal. The difference this year will be Jim's experience at skip. He reads the ice so well and can plan out the end, so I just do a lot of nodding in agreement as third." Ina Forrest - second (46) was born in Fort St. John and has lived for the last ten years in the Okanagan in Armstrong, BC. She is married to Cu rtis and has 3 children; Evany, Marlon and Connor, one dog, 3 cats and 5 horses. She began curling in 2004, talked into trying it by someone she met while shopping, and her highest moment was playing in her first Nationals in November 2004. "It was my first competition, on a selected team skipped by Jim Shannon. We lost the Canadian Nationals final by a couple of millimeters on a measurement. In 2007 I was an alternate at the Worlds, and played 2nd at the 2008 tournament. I still get nervous when I play, though not all the time. I've always felt we have had the chance to win. We get stronger each year, but so do the competition. The team goal this year is a podium finish; mine is to come away feeling I have done everything I can to help the team win. I relax when I have thrown my last rock, and I always hope that it is a good rock so that I end the game on a positive." Chris Sobkowicz - lead (55) was born in Winnipeg, where he lives with his wife Sherry and two sons Jaret and Jordan. He b egan curling in 2004 and has skipped Team Manitoba at 4 Canadian National Championships, winning bronze in 2008. His biggest thrill in curling was hearing that he had been selected to the 2009 team. "I have been asked to play lead, a new position for me. I always skipped for Manitoba and have been playing 2nd as part of the Team Canada squad. But I am thrilled to play at any position, and my personal goal for this tournament will be not only to make my shots, but to score a high percentage. The team is quietly confident that we have the ability to do well. I'll take the games as they come but I am particularly looking forward to playing Germany, who have been great hosts and are really good people." Sonja Gaudet - alternate (42) was born and raised in BC, and lives with her husband Dan, daughter Alysha and son Colten in Vernon, in the Okanagan Valley in central BC. She became a paraplegic after a horse riding accident in 1997 but has continued her passion for sports, including skiing, swimming, tennis and of course curling, which she began in 2002. Her first competitive curling success was a silver medal at the 2003 National Championships, and the highlight of her curling career so far was a National Championship in 2006 and a gold medal in Torino at the Paralympic Games 2006. Sonja has been an ever-present member of Team Canada since 2005 and this will be her 3rd World Championship. "Curling gives me the opportunity to continue to strive for excellence in sport and competition - which I love to do - even after a spinal cord injury. I hope to continue to improve my technical ability in curling and be on the team that will compete at the Paralympic Games in Vancouver 2010. I hope that I can be a role model who sends this message - Always Believe and Giving up is not an Option!" Joe Rea - coach (50) was born in Vancouver and has lived in Prince George BC since 1972. He is married to Colleen and they have 3 children, Bailey, Kirstie and Dustin, and three foste r children. He began curling at 14 and has competed at the Men's BC Provincial Championships. He became Team Canada coach in 2004 and took his team to a gold medal at the 2006 Torino Paralympics. "We have been a very consistent team for a few years now, without being able to close at recent World Championships. We were just a hit away from the final at last year's event. Darryl will have benefited from playing last year and Jim Armstrong brings experience and understanding that only comes from decades of playing the game. We are not taking any of our opponents lightly. This is a very experienced field that will force us to bring our "A" game if we expect to be successful." Team Canada to win in a walk, no pun intended.